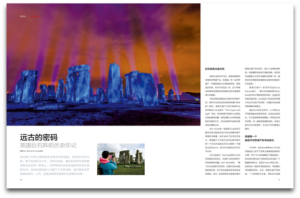 Press releases can be about anything that piques the interest of Chinese audiences, from quirky stories about a light show at Stonehenge, to the unique history of the UK’s most popular heritage sights. We have recently delivered two very different kinds of press release for English Heritage – one about the flamboyant Kari Kola light show at Stonehenge, and the other about the tiny Myrtle flower and its royal history. The results have been exceptional for both stories. Our “Stonehenge is illuminated to celebrate UNESCO World Heritage Day” press release detailed Kari Kola’s spectacular light show and its Impact with Light project, which aims to increase awareness of cultural history and global issues such as climate change. The release also gives Chinese audiences an overview of Stonehenge’s history and World Heritage status and offers advice on how to access the attraction. 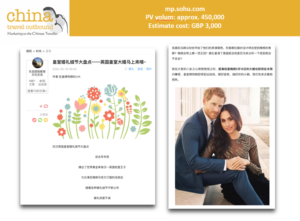 We were extremely pleased with the coverage this press release received in Chinese media outlets; it featured in seven articles and posts with a total estimated media value of over £37,000. 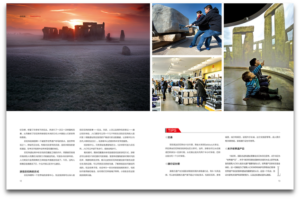 One particular article in Let’s Go Magazine showed the content of the press release in two beautiful double-page spreads – this magazine is distributed on Southern China’s trains and is read by approximately 5,000,000 people. This article’s media value is estimated at £12,000. Our press release for English Heritage for the Royal Wedding regarded “The mystery of Myrtle – a royal wedding tradition”, exploring the flower’s royal significance, having been introduced into royal wedding bouquets in 1858. The Myrtle itself comes from the gardens of Osborne House on the Isle of Wight. The release was sent out in May in time for the Royal Wedding, ensuring the best levels of coverage for the story. The release gained significant traction in China, featuring in seven distinguished articles and posts on Chinese travel websites and influential social media accounts, with a total estimated media value of £15,900. Once the clippings are received, we compile screenshots of the articles and posts and media value figures into a report for our clients to evidence their success (see right). Press releases are a great way to reach and grab the attention of Chinese audiences and help them understand your brand. When you are entering the Chinese market, releases can be a great way to show your commitment to China. They are also an effective channel as editorial coverage can be purchased for guaranteed space. If you are interested in a press campaign in China, please don’t hesitate to get in contact with us at: 01273 262700, or drop us an email at brighton@chinatraveloutbound.com.